Right now I have 360 contacts on LinkedIn and I don’t have a clue who most of them are. But last week I rolled out a major redesign of my blog and my natural desire was to let everyone know about it. So when my friend reached out to me about his newly developed LinkedIn tool, I decided I should definitely give that a spin. Why Did I Decide To Reach Out? Since I’m not a big fan of this social network, I literally did nothing to grow the list of my LinkedIn connections and still ended up having 360 contacts. I don’t know most of these people and I’m pretty sure they hardly know me as well. So I decided it would be a good idea to reach out to everyone with a short message to let them know about me and see where it goes. So I opened the software and followed the built-in instructions. First of all I had to export my contacts from LinkedIn and import them into the tool. “Import” will obviously import that list you’ve just downloaded into LinkedIn Mailer. Once the tool is done importing your LinkedIn contacts you should click on the “Connections” tab and you’ll see a very neat spreadsheet with all your LinkedIn connections. The tool has some awesome filtering options in case you want to only target people from a specific country or based on what they do. But I just wanted to reach out to everyone, so I clicked the “Messaging” button. I decided that my message should be real short. All I wanted is to tell everyone that I have a blog and what the blog is about. I also thought it would be relevant to apologize for the mass message for some people might hate that. The cool thing is that you can send personalized messages by automatically using the name of a person in your greeting. Which I did. The message was ready so I just clicked “Send” and allowed the tool a bit of time to send 360 direct messages to my LinkedIn contacts. I knew from the very beginning that I’m not doing it for traffic. The open rate of my email list rarely goes above 40% and the CTR is usually about 10%. And I didn’t expect my LinkedIn contacts to be more responsive than my email subscribers. What I was looking for is some hidden opportunities. And I wasn’t even looking for any of that! I think I could do much better if I had a specific goal to reach out with. Like I said, I have never invested any of my time in LinkedIn and so my list of connections is quite small and non responsive. 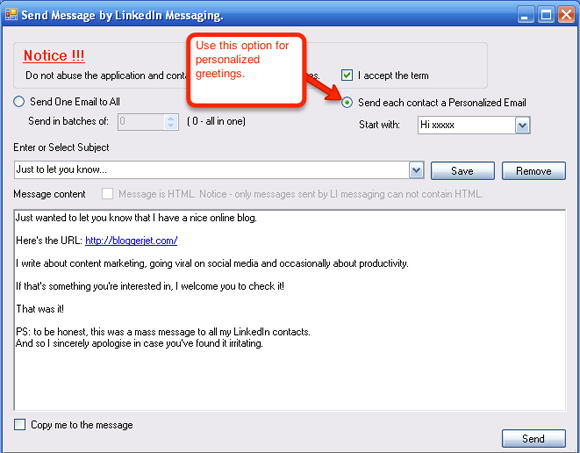 But for people who are active on LinkedIn mass messaging could be the holy grail of hidden opportunities. Write a brief message about what you do and what you’re struggling with and reach out to your contact list. I’m convinced that many people will offer their help and expertise to you. This is not an affiliate link, so I won’t get any commission in case you decide to purchase the software. And my friend Karl is not paying me for this article too. I used the tool myself and got some nice results with it that I’d like to share with my readers. I have my own tool (TweetDis plugin) and I know how hard it is to go out and promote your work online. So I’m glad I can help Karl a little bit and let some more people know about his cool tool. UPDATE 21 May 2015: It seems like something wrong has happened to that piece of software since I wrote this article. Please read this comment from Kevin to understand what I’m talking about. Purchase this piece of software at your own risk. I do not guarantee that it will work the same way it worked for me at the time of writing this article. UPDATE 1 June 2015: the number of comments from “unsatisfied customers” just keeps growing. You may also want to check this thread at WarriorForum. 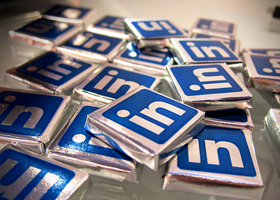 So what are your thoughts about mass messaging on LinkedIn and about this social network in general? What do you mainly use LinkedIn for? Is it effective? Thank you so much for this article! I had no idea that this tool existed and I’m going to check it out. I think this tool is neat, but there are free workarounds to this – like mailing 50 people at a time. However, for people with thousands of contacts, this tool would be very beneficial. But what about the issue of using LI as a mailing system? Aren’t there some laws about this? I would like to know what the anti-spam laws are regarding sending mass emails to your LinkedIn contacts. Do you know anything about them, Tim? Hey Lorraine, thanks a lot for stepping by! Yeah.. I remember that link you’ve shared with me regarding group messages.. but like you just said, it’s not relevant for people with huge lists of connections. I feel offering value was the way to go. Smart move. If you mass message them, kill them with value, meaning point them to your blog full of free, helpful updates. Also, I like the move about noting the mass message/might be agitating deal. This is a compassionate, friendly approach which takes down folk’s guards, in a big way. Well done. Well… I could provide even more value and offer my contacts to ask me anything blogging/marketing related if they’re struggling with it.. So maybe I would do this next time ;) Thanks for the idea! After reading this article i quickly used this tool and its very helpful for me to send my messages to every one in one click of the button.thanks for your tool and your article. It seems like this tool is no longer available. Any suggestions on similar tools that are available? Before coming into TWC. My contacts to be emailed. Will automaticly be placed in my to send to list. TWC does not do this. How can I get this to accept a way to get this placed so I can do my entire family in a email? I purchased this product after reading your article. I have it downloaded and installed, but it doesn’t seem to work for me. The version I have does not have the same interface as the screencaps you posted, and the Import button doesn’t respond when I click on it. I’ve emailed tech support, and even Karl, but have not heard back. Is there anything you can do to assist me? I would appreciate your help. If you can somehow get in touch with the Linkedin Mailer team, please ask them to contact me at the email I’ve provided. Hey Kevin… wow.. that is very lame.. I’m sorry, there’s no way I could help you..
Have you found a solution??? Have you got your money back?? I have purchased this program (linked 3.0.4) and installed it. 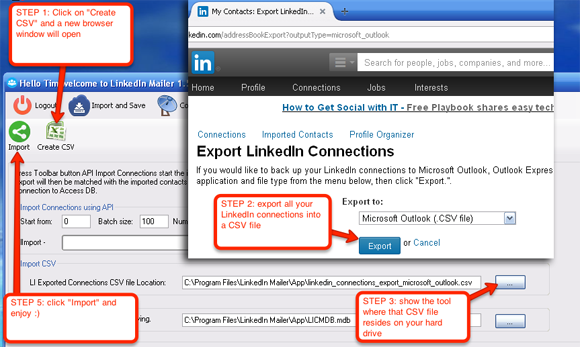 Unfortunately, I cannot import my LinkedIn csv file and I cannot find anywhere that gives me instructions on what to do i.e. there is no Help menu. I looked at the promo video and my screen is totally different to that. I purchased LinkedIn Mailer and have the same issue at Kevin and David. The product does not work, and I have tried contacting their customer support three times. Please take down this article, as you should now have enough verification to realize that this is misleading people to buy a fraudulent item. Hi Tim or anyone out there who can help. I have exactly the same problem as Kevin. To anyone thinking of buying this program – BEWARE! I was really looking forward to purchasing this software, but it is now unavailable. If anyone knows of a viable alternative, please let me know! This is a scam, do not buy the linked in mailer! It does not work! The developer will not return emails and will not refund money! 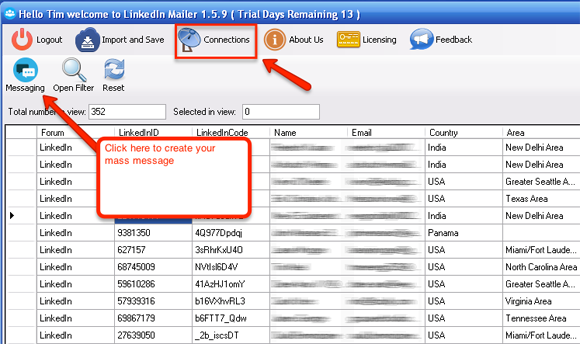 This tool does not work anymore because they have changed and you cannot export your contacts any more.